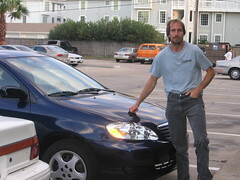 We seem to have a new car - it's a 2007 Corolla. (It has some letters after it but I can't ever remember that kind of thing.) We had lunch with my mom and Art, and Art told us how much he hated his dark-blue car and how we shouldn't ever buy one that color, and what did we buy? You guessed it.